Blyth Town face cross-town rivals Blyth Spartans in an eagerly anticipated pre-season friendly on Saturday. The Northern League division two team will entertain their Evo-Stik Northern Premier League premier division neighbours at their South Newsham ground. With competitive matches officially starting in August, for Blyth Town it will be their first time in the EBAC Northern League after they won the Northern Alliance premier division for the third time in a row last season, allowing the team to be promoted into Northern League. Manager Mick Connors said: “Although to most this game will just be another friendly, to me it makes the last three years of hard work all worthwhile. “Spartans were the first team I ever went to watch with my dad and we respect them a lot as a club, so this friendly marks a landmark for both the team and myself as we welcome Tom Wade and his team to our ground. 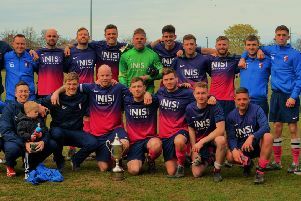 Thanks to a £500,000 investment provided by Blyth businessman Barry Elliott, the funds have provided the necessary requirements to enable Town to move up the league pyramid having previously relied on the support of local community funds and sponsorship. The club has upgraded its pitch to Northern League One standard – Grade H – as well as a new flood-lit training ground, larger dressing rooms and improved clubhouse facilities which serve the local community. Speaking of the investment and growth into the EBAC Northern League, Blyth Town Football Club chairwoman Sandra Orr said: “It’s fantastic that we can use most of the first team investment to pay for the best coaches, management, facilities and equipment to help us with league success and apply for further promotion. Saturday’s friendly kicks-off at 2.30pm. Supporters can pay £5 on the gate, which includes complimentary drink from the clubhouse bar, and concessions are available by contacting the club on 07710 715045.